Why settle for a below-average yield when better options are available? Even after February's double-digit hike, Comcast's (NASDAQ: CMCSA) dividend yield trails the broader stock market's 2% average. The good news for income investors, though, is that there are plenty of stocks out there that boast higher yields, and they don't require you sacrificing much in the way of growth potential or earnings stability. So today I'm taking a look at three comparable companies -- Time Warner (NYSE:TWX.DL), AT&T (NYSE:T), and Viacom (NASDAQ:VIA) -- that have Comcast beat in the dividend department. One of the most attractive aspects of Comcast's business is its rock-solid diversity, as the media giant gets profit contributions from cable delivery services, box office movies, broadcast TV networks, and theme parks. Time Warner isn't quite as diversified, but its operations still generate a healthy mix of earnings across its Turner broadcast segment, its HBO subscription division, and its Warner Bros movie and video game studios. When one area of the business comes up short, as the film division did last year, other segments can step up to keep overall results churning higher. Time Warner's dividend is comparable to Comcast's in most of the key metrics, including a low payout ratio and a history of double-digit rate increases. But income investors will find its 2.2% yield more enticing. For raw dividend yield, you might prefer AT&T and its meaty 5% payout. Just be sure you know the trade-offs when reaching for such an unusually high dividend. AT&T's payout growth is barely beating the pace of inflation lately, rising just 2% in each of the last three fiscal years. There are two other red flags to watch out for as well. 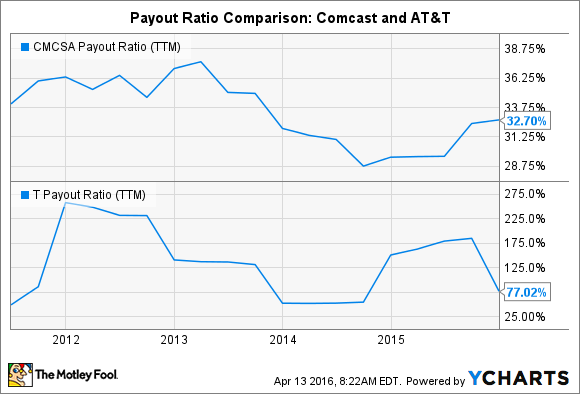 First, the telecom giant pays out a distressingly high 77% of earnings as dividends, and a few times over the last five years it has even risen to above 100%. Over the same stretch, Comcast's hasn't ever crossed 40% of profits. CMCSA Payout Ratio (TTM) data by YCharts. Second, income investors should keep an eye on AT&T's high debt level, which helped it acquire DIRECTV but is eating up a big portion of earnings. Until management can step profit growth up a notch, and start lowering that debt burden, the dividend isn't likely to rise at anything better than its recent snail's pace. Viacom's portfolio of TV channels and movie studios hasn't provided much growth lately. Like Comcast, the company's advertising revenue is down as ratings slip due to a shrinking subscriber base. At the same time, a weak box office outing (in comparison to a prior-year period that featured the hit Teenage Mutant Ninja Turtles) helped push overall profits down 13%. Ratings are headed higher at most of Viacom's networks. Image source: Viacom. "2015 was a challenging year operationally as we redesigned ourselves and adapted to significant industry disruption," CEO Philippe Dauman explained in a February earnings release. Yet Viacom is seeing rising ratings at most of its networks, including VH1, Spike, BET, and CMT, and its Paramount studio could turn things around with its diverse slate of film releases this year. In the meantime, shareholders can enjoy an almost 4% dividend -- one that's nearly tripled to $0.40 per share since it was initiated in 2010 at $0.15 per share.